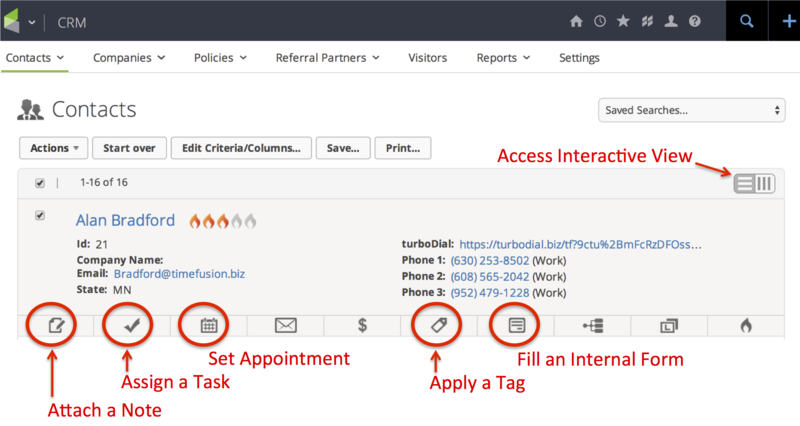 You can easily review notes, assign a task, trigger a campaign, etc while you are using turboDial because the turboDial popup is intentionally small and designed to reside on your computer screen right next to your Infusonsoft window. If you use the “Interactive View” for your contact listings, or the My Day view, then you have easy access to the Notes, Tasks, Internal Forms and other tool buttons associated with each contact. Moving your mouse between turboDial and Infusionsoft is a seamless experience – you can access the tool buttons on either window at any time. Review the existing Notes for a contact. This is a quick way to see the recent phone calls made using turboDial and use that knowldege as you make the next call to the contact. When you attach a Note you can choose a Note Template. That Note Template can be either a Template you have created or a Note Goal. If you attach the note for a Note Goal it will trigger that Goal in your Infusionsoft campaign. So as an example, you could attach a Note to document you left a Voice Mail and trigger a campaign to send an email telling the customer you tried to reach them. You might assign a Task in the case your phone conversation resulted in a need for follow up. For example, when you need someone to gather some information and get back to the customer. You could fill an Internal Form to add information to the Contact Record and/or trigger a campaign to begin. Users of TimeFusion Messenger can use this Internal Form to send an ad-hoc SMS message to the customer. You can also apply or remove a Tag here.